Large Laundry Bag with bespoke embroidered initial. Large Laundry Bag with bespoke embroidered initial. A tidy storage solution for around the house and handy for taking clothes to be laundered. We will professionally embroider a large letter or number onto this sturdy natural cotton canvas drawstring sack. 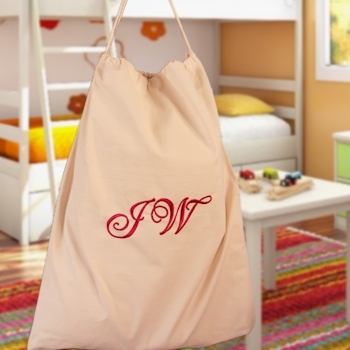 We will professionally embroider a large letter or number onto this sturdy natural cotton canvas drawstring sack. The giant sack is very good quality and measures 60cm wide by 76cm in height and will hold lots of clothes. Please enter one or two initials or numbers you would like embroidered. Select the font style you prefer. Beautifully sewn in a thread colour of your choice to make a fantastic Personalised sack. Can also be used as a toy storage sack or even a birthday present sack!